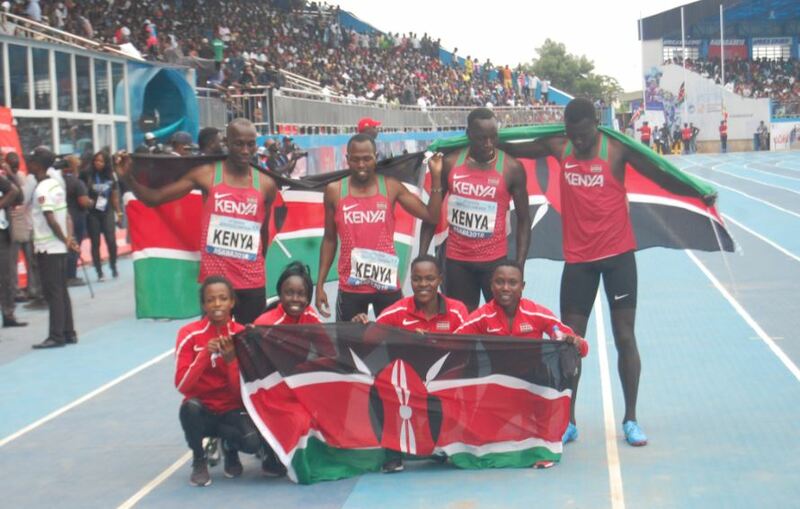 2018 is turning out to be a succesful year for Kenya athletics After finishing atop the standings in the IAAF U20 championships, Kenya was on top again, this time finishing atop the standings at the 2018 Africa athletics championships. Kenya’s performance was first class. It is difficult to pinpoint the best performance. So instead this article focuses on the most noteworthy performances. Perhaps the biggest highlight was the Kenya women’s 4 X 100m team. They won the bronze medal, finishing only behind Cote’d Ivoire team that boasted the world’s fastest woman Marie Jose Ta Lou and Nigeria who finished second. The Kenyan quartet of Eunice Kadogo, Millicent Ndoro, Joan Cherono and Frashia Mwangi showed excellent technical skills from start to finish from drive phase, efficient baton exchanges and finally with all four digging deep to secure a medal for Kenya with a time of 45.58 . Frashia Mwangi ran a storming final leg fending off the South African runner. The time is slower than the 44.75 that they accomplished at the 2015 All Africa games. Three of them with the exception of Cherono were in the team that finished fourth at the 2015 All Africa games, coming agonizingly close to winning a medal. They deserve to be rewarded. Their performance brings back memories of the 1980s. In 1984 Kenya recorded its best ever performance in the 4 X 100m when the team led by Joyce Odhiambo won the gold medal. Odhiambo had bagged the silver in the 100m and held the Kenya record at 11.62 for nearly 28 years before Eunice Kadogo broke it in 2015. Sawe was outstanding in an event that Kenya has never done well in. 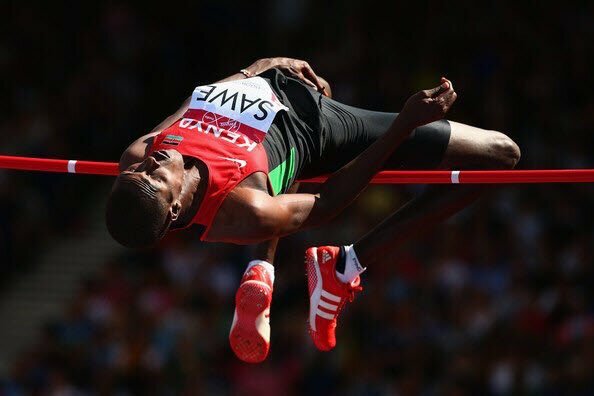 In 2016, Sawe became the first Kenyan to win a continental event in this event in 2016 with a jump of 2.21 metres. He went on to retain it with a jump of 2.30m which equals the Kenya national record. In the process he relegated the two South Africans to silver and bronze. The jump puts Sawe among the world’s top high jumpers in 2018 and should warrant an invite to a Diamond League meet. Winny Chebet has had an illustrious running career. She has represented Kenya for 12 years. She started representing the country when she was 15, running in the world youth athletics championships where she won two silver medals. She has also run in numerous continental events but has never won individual gold. She had won medals in the 4 X 400m, which shows her incredible range / versatility. But she has never given up. In fact the way she won the 1500m at the 2018 African championships showed her determination and refusal to give up. In the last 100 metres, she had to dig deep to fend off the two experienced Moroccans (Rababe Arafi and Malika Akkaoui) who were surging and gunning for the gold medal. Both Moroccans are far more established in this event and have run in numerous Diamond League meets compared to Chebet who for most of her career has specialized in the 800m. Samuel Gathimba has had an illustrious race walking career. He won a silver medal at the 2014 African championships, another silver medal at the 2015 All Africa games, gold medal at the 2016 African championships and a bronze medal at the 2018 Commonwealth games. However his gold medal at the 2018 African championships is perhaps the most important medal of his life. His razor thin victory over South African Lebogang Shange was pivotal in enabling Kenya to finish atop the medal standings. Had Shange won, South Africa would have topped the standings and Kenya would have finished second. And Gathimba had to dig deep, winning in 1:25.13, only nine hundredths of a second ahead of Shange who clocked 1:25.24. A very narrow margin for the race walk. Kenya had to contend with the loss of experienced quarter-miler Boniface Mweresa who was sent packing from the tournament after he tested positive for a banned substance. But this did not stop Kenya as they not only won, but also won by a large margin and with a superb time of 3:00.92, much faster than has been recorded at this event lately. Kenya last won this event in 2010. After that, the team led by Mweresa had won the gold medal at the 2015 All Africa games, holding off the much fancied Botswana that had a sub 44.00 runner Isaac Makwala as its anchor. What also made this win great was that Kenya stitched together a team that had a number of runners who do not specialize in the 400m. Haron Koech is a 400m hurdler, while anchor Emmanuel Korir is an 800m runner. The experienced Alphas Kishoyian ran a stormer, putting Kenya firmly in the lead, a lead they did not relinquish when he handed the baton to Jared Momanyi. By the anchor leg, Kenya was firmly in the lead. Grace Wanjiru Njue has won the African championships 20km race walk for women an incredible 6 times ! She has also won a gold medal at the All Africa games (in 2015). She also won a bronze medal at the 2010 Commonwealth games. This time she settled for silver after finishing second to Ethiopian Yehualiye Belew. It has been an illustrious career and knowing how determined Wanjiru is, we are certain that she will still come back strong for the 2019 All Africa games. The Kenyan women 4 X 400m quartet also shone on the final day, taking silver in 3:35.45 behind the Nigerians (3:31.19). Edward Zakayo Pingua, fresh from his gold medal at the IAAF U 20 championships, won the men’s 5000m in 13:45.41. Smooth running Beatrice Chepkoech, fresh from a world record breaking performance, led a Kenya sweep in the 3000m steeplechase. She won in 8:59.85 and was followed home by Fancy Cherotich and Cellphine Chespol. “I promised my parents that I would go back with gold and I’ve done it,” she said. In the javelin, Julius Yego who has had a slump in the past two years, reclaimed his javelin title with a second round throw of 77.34 metres with South Africa’s Philmar van Rensenburg (76.57m) taking silver and Nigeria’s Kure Adams (75.69) bronze. It was another important win over a South African that helped Kenya top the medal standings. Hellen Obiri was peerless when she started Kenya’s gold medal hunt, blowing away the field to win in 15:47.17. Stacey Ndiwa won the women’s 10,000m, finishing ahead of defending champion and compatriot Alice Aprot. The duo finished well ahead of the rest of the field. Ndiwa was elated. “After the Commonwealth Games in Gold Coast, I felt that my speed wasn’t good enough and so I put in a lot of speedwork training in Iten and that’s why you saw me kick so well in the last 400 metres.” said Ndiwa. In the men’s 1500m, Kenya went 1-2 as expected with Elijah Manangoi taking gold ahead of Timothy Cheruiyot. The latter has been dominant in the Diamond league this season and came in as the favourite. Conseslus Kipruto continued Kenya’s dominance in the men’s 3000m steeplechase , beating the Morrocaan El Bakkali. Though Kenya has dominated this event in the past, it was not a certainty that Kipruto would win since El Bakkali beat him in their last Diamond League race in Monaco. The gold medals were mined through Hellen Obiri (5,000m), Mathew Sawe (high jump), Julius Yego, (javelin), Conseslus Kipruto (steeplechase), Beatrice Chepkoech (steeplechase), 4x400m relay (men), Samuel Gathimba (walk), Elijah Manang’oi (1,500m), Edward Zakayo (5,000m), Winny Chebet (1,500m) and Stacey Ndiwa (10,000m). 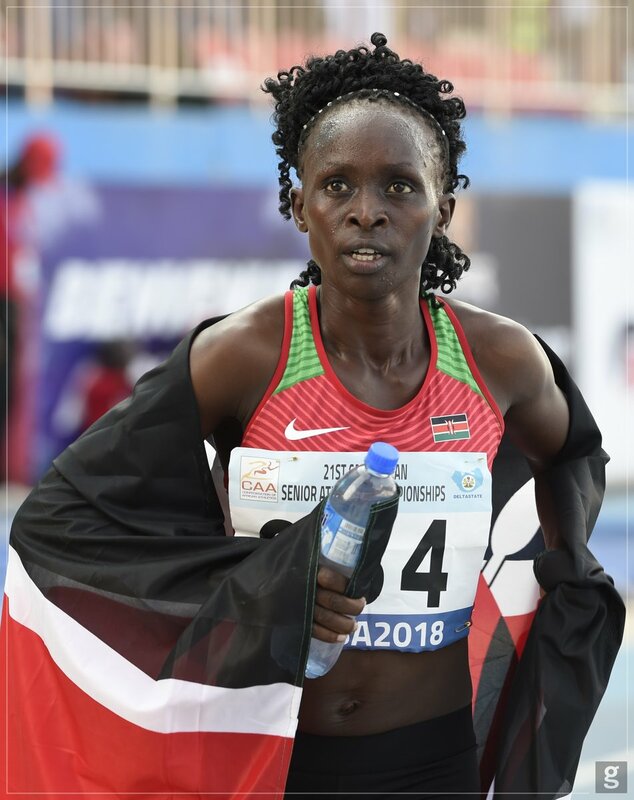 The silvers were eked out by Alice Aprot (10,000m), Timothy Cheruiyot (1,500m), Emmanuel Korir (800m), Celliphine Chespol (steeplechase), 4x400m relay (women) and Grace Wanjiru (walk). 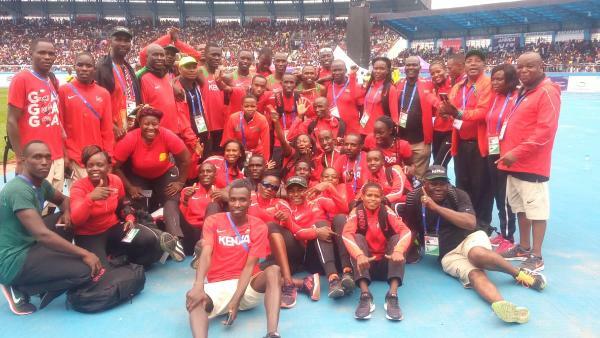 This entry was posted in Kenya Athletics News, Kenya Sports news and commentary and tagged Emmanuel Korir, Frashia Mwangi, Grace Wanjiru, Mathieu Sawe, Winny Chebet. Bookmark the permalink.